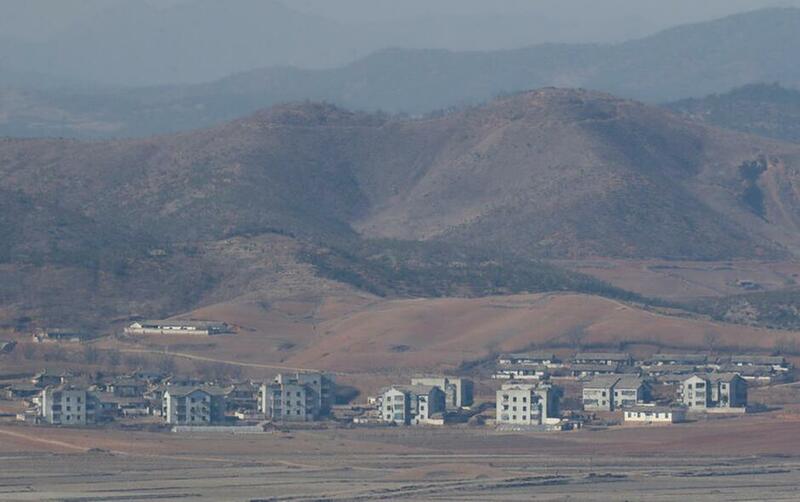 North Korea's town Kaepoong is seen from the unification observatory in Paju, South Korea, Sunday, Feb. 12, 2017. North Korea reportedly fired a ballistic missile early Sunday in what would be its first such test of the year and an implicit challenge to President Donald Trump, who stood with the Japanese leader as Shinzo Abe called the move "absolutely intolerable." PYONGYANG, NORTH KOREA (AP) — In an implicit challenge to President Donald Trump, North Korea appeared to fire a ballistic missile early Sunday in what would be its first such test of the year. After receiving word of the launch, Trump stood at his south Florida estate with Japanese Prime Minister Shinzo Abe, who called the move "intolerable." There was no immediate confirmation on the launch from the North, which had warned recently that it was ready to test its first intercontinental ballistic missile. The U.S. Strategic Command, however, said it detected and tracked what it assessed to be a medium- or intermediate-range missile. North Korean media are often slow to announce such launches, if they announce them at all. As of Sunday evening, there had been no official announcement and most North Koreans went about their day with no inkling that the launch was major international news. The reports of the launch came as Trump was hosting Abe and just days before the North is to mark the birthday of leader Kim Jong Un's late father, Kim Jong Il. Appearing with Trump at a news conference at Trump's estate, Abe condemned the missile launch as "absolutely intolerable." Abe read a brief statement in which he called on the North to comply fully with relevant U.N. Security Council resolutions. He said Trump had assured him of U.S. support and that Trump's presence showed the president's determination and commitment. Trump followed Abe with even fewer words, saying in part: "I just want everybody to understand and fully know that the United States of America stands behind Japan, its great ally, 100 percent." Stephen Miller, Trump's chief policy adviser, said Trump and Abe had displayed "an important show of solidarity" between their nations. "The message we're sending to the world right now is a message of strength and solidarity; we stand with Japan and we stand with our allies in the region to address the North Korean menace," Miller said during an interview Sunday with ABC's "This Week." 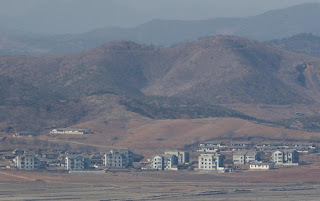 South Korea's Joint Chiefs of Staff said in a statement that the missile was fired from around Banghyon, North Pyongan Province, which is where South Korean officials have said the North test-launched its powerful midrange Musudan missile on Oct. 15 and 20. The military in Seoul said that the missile flew about 500 kilometers (310 miles). South Korea's Yonhap News Agency reported that while determinations were still being made, it was not believed to be an intercontinental ballistic missile. The missile splashed down into the sea between the Korean Peninsula and Japan, according to the U.S. Strategic Command. Japanese Chief Cabinet Secretary Yoshihide Suga told reporters that the missile did not hit Japanese territorial seas. The North conducted two nuclear tests and a slew of rocket launches last year in continued efforts to expand its nuclear weapons and missile programs. Kim Jong Un said in his New Year's address that the country had reached the final stages of readiness to test an ICBM, which would be a major step forward in its efforts to build a credible nuclear threat to the United States. Though Pyongyang has been relatively quiet about the transfer of power to the Trump administration, its state media has repeatedly called for Washington to abandon its "hostile policy" and vowed to continue its nuclear and missile development programs until the U.S. changes its diplomatic approach. Just days ago, it also reaffirmed its plan to conduct more space launches, which it staunchly defends but which have been criticized because they involve dual-use technology that can be transferred to improve missiles. "Our country has clearly expressed its standpoint, that we will continue to build up our capacity for self-defense, with nuclear forces and a pre-emptive strike capability as the main points, as long as our enemies continue sanctions to suppress us," Pyongyang student Kim Guk Bom said Sunday. "We will defend the peace and security of our country at any cost, with our own effort, and we will contribute to global peace and stability." Kim Dong-yeop, an analyst at the Institute for Far Eastern Studies in Seoul, said the missile could be a Musudan or a similar rocket designed to test engines for an intercontinental ballistic missile that could hit the U.S. mainland. Analysts are divided, however, over how close the North is to having a reliable long-range rocket that could be coupled with a nuclear warhead capable of striking U.S. targets. South Korean Prime Minister Hwang Kyo-ahn, who is also the acting president, said his country would punish North Korea for the missile launch. The Foreign Ministry said South Korea would continue to work with allies, including the United States, Japan and the European Union, to ensure a thorough implementation of sanctions against the North and make the country realize that it will "never be able to survive" without discarding all of its nuclear and missile programs. Associated Press writers Kim Tong-Hyung in Seoul, South Korea, and Jill Colvin in Palm Beach, Florida, contributed to this report.